EPW025490 ENGLAND (1928). British International Pictures Film Studios, Borehamwood, 1928. This image has been produced from a damaged negative. 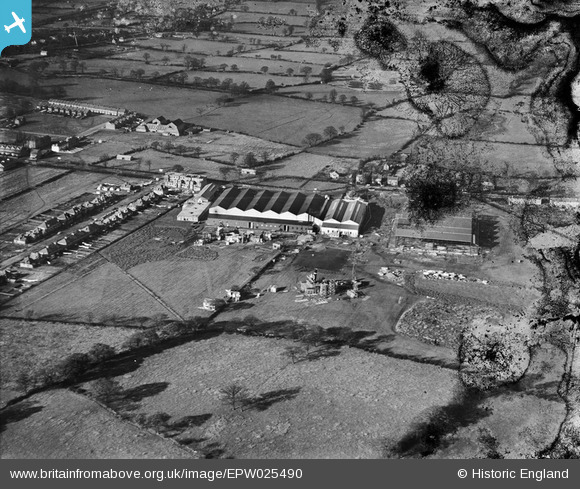 Pennawd [EPW025490] British International Pictures Film Studios, Borehamwood, 1928. This image has been produced from a damaged negative. Looks like the bridge of ship. The funnel seems a bit close. The afterdecks are in place, but no bows. The ship set could have been that used in the 1929 film Atlantic (http://en.wikipedia.org/wiki/Atlantic_(film)) which was filmed at the British International Pictures Film Studios at Borehamwood. The film is set on an ocean liner. It is being constructed rather than demolished as it is not present in the July 1928 photo of the same area EPW021914. Alfred Hitchcock's 1928 film Champagne (http://en.wikipedia.org/wiki/Champagne_(film)) also filmed here and was also partly set on a liner, but it was released in September 1928 so too early to be the film for which this is a set.